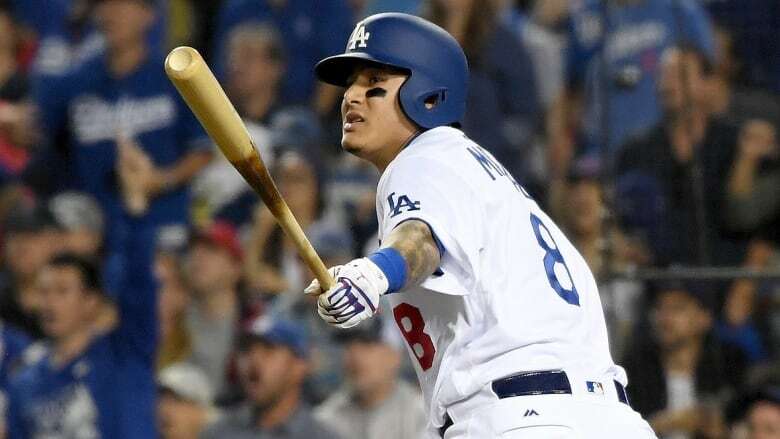 Dodgers shortstop Manny Machado admired what he thought was a home run Friday night that turned out to be a 368-foot single off the left-field wall. Earlier in this post-season, he was criticized for not hustling during a groundout in the NLCS against Milwaukee. Manny Machado's lack of hustle is starting to stand out more than his offence this post-season. The star shortstop had a little too much self-confidence in the sixth inning Friday night when he thought he homered for the Los Angeles Dodgers during Game 3 of the World Series against the visiting Boston Red Sox. Instead, Machado ended up admiring what turned out to be a 368-foot single as it bounced off the wall in left field. Had Machado run it out, it might have been a double. It also turned out to be his only hit as he went 1-for-7 in the Dodgers' 3-2 win in 18 innings early Saturday that trimmed their Series deficit to 2-1. "I looked up at first and thought it wasn't going and then I saw it take up and thought it was going to go out," Machado said. "That was very, very, very, very, very poor base-running by me." It is not the first time this post-season that Machado's effort level has become an issue. He was criticized for not hustling during a groundout in Game 2 of the National League Championship Series against Milwaukee. Machado said in an interview on FS1 during the NLCS that he's well aware he's not going to be known as a hustling type of player, but that is how he has played throughout his career. He was much more critical of himself after Friday night's game. "I probably wasn't going to be on second base but that was very embarrassing," he said. Things didn't get much better for Machado in the eighth when he struck out on Matt Barnes' high fastball on a full count with a runner on first. Two innings later he popped out to shortstop Xander Bogaerts after Max Muncy doubled with two outs. That dropped Machado to 0-for-9 in his career against Boston closer Craig Kimbrel. Machado also flied out in the 13th after Muncy walked leading off the inning. The 26-year-old Machado can become a free agent this off-season and is expected to command a large contract. He drew the ire of Milwaukee players and fans, not to mention a fine, for kicking Brewers first baseman Jesus Aguilar near the ankle as he jogged out a groundout during the NLCS. There was also a pair of hard slides into Orlando Arcia in Game 3 while the Milwaukee shortstop was attempting to turn double plays. The antics led Brewers star Christian Yelich to call Machado "a dirty player," but the Dodgers slugger has seemed to embrace the role of villain this October. The base-running gaffes are overshadowing what has been a productive month for Machado, acquired from Baltimore on July 19. He is batting .255 in the post-season but leads the Dodgers in home runs (three) and runs batted in (11). Machado is 3-for-14 in the World Series but thinks the Dodgers have momentum after their dramatic win. "This is huge. We were grinding until the last run came across the board. We're 2-1 in the Series, which we needed," he said. "We'll get some rest and get back at it."